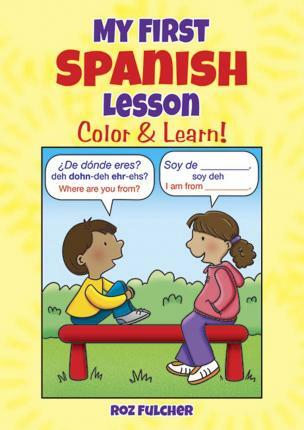 My First Spanish Lesson : Color & Learn! ¿Hablas español? (Do you speak Spanish?) You can say sì with this fun and educational coloring book. More than 60 pages of kid-friendly illustrations and easy vocabulary, accompanied by pronunciation guides, offer a fun and memorable way to learn a new language. Terms include days of the week, months, food, and clothing as well as simple phrases such as "Excuse me" and "What's your name." Craft designer and teacher Roz Fulcher has created art that's appeared in Highlights magazine, Reader's Digest, and other books by many major publishers. She has received an honorable mention in Smartwriter's WIN competition. Roz has also authored Be Good To Your Body: Healthy Eating, Be Good To Your Body: Learning Yoga, Science Around the House, and Mind Your Manners for Dover.